No time to clean and tidy your home? Don’t panic. 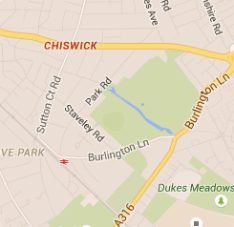 Call our company and hire one of our teams of domestic cleaners in W4 Chiswick. We are very professional and our reputation is great. We demonstrate great cleaning practices and expertise. Our home cleaning service is customisable and flexible. We offer one off cleaning sessions as well as monthly, weekly and daily sessions. Our goal is to help you keep a hygienic home while juggling all your responsibilities. We are effective and diligent and we promise to leave your home gleaming. 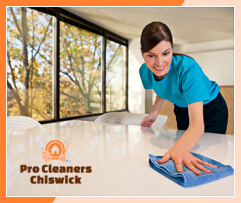 Pick up the phone and call Pro Cleaners Chiswick. We are there for you. 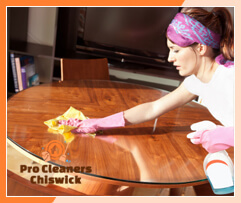 When you are tired of scrubbing the house and you want high-quality results from the person you hire to get the job done for you, know that our domestic cleaners in W4 Chiswick are the best pick. They will work to your satisfaction. A polite and outgoing staff personnel will answer your call and write down every detail you share with us so that we can make your service more personalised. We will set up a no-obligation quote and provide you with any additional information you might need. After having a word with you about your needs and expectations, we will create a customised cleaning plan for your home. Next, you have to specify at which time of the week you are free to have the service carried out. We will do our best to find a day that best fits your busy schedule, whether during the weekend or throughout the week. To ensure high-quality cleaning practices for your home, our staff will work from your customised cleaning plan. The work gets done within a few hours and we work a minimum of three hours. While one cleaner focuses on your bedroom and living areas, another one will clean your bathroom and kitchen. With our domestic cleaners in Chiswick London you can relax. Your home will be clean and shiny.